The cost to replace a heat exchanger in Minneapolis ranges from $1,000 to $2,000. It’s true that the heat exchanger is one of the most expensive parts on a furnace to repair. And since a heat exchanger is central to your furnace (it’s the part that actually transfers heat to your home’s air), if it’s broken, your furnace won’t work. Well, a cracked heat exchanger is dangerous because it can leak deadly carbon monoxide into your home’s air. But here’s the problem: Some HVAC service people lie. They say you have a cracked heat exchanger—even when you don’t— to scare you into replacing your heat exchanger or furnace when you don’t need to. 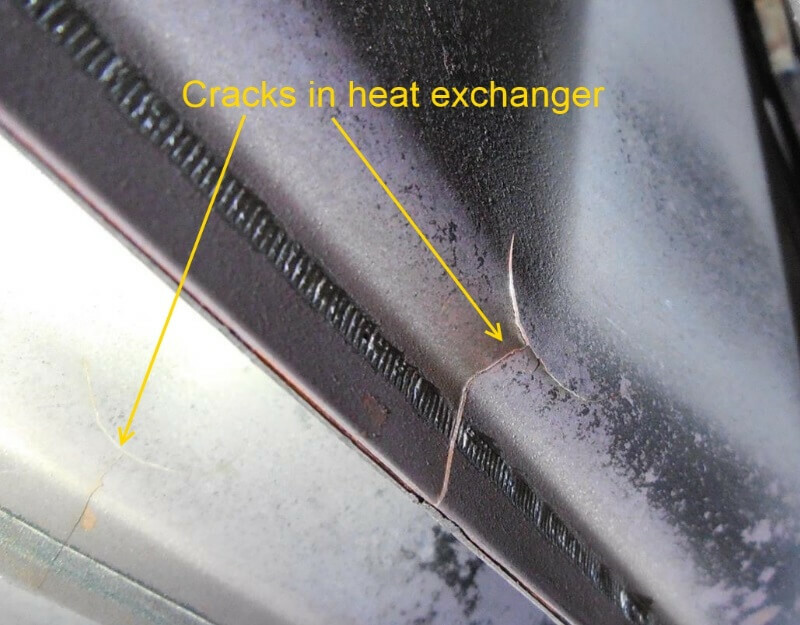 Visual metal cracks: The AHRI guidelines also make it clear that an HVAC technician should visually inspect all heat exchanger surfaces, as that’s really the only way to tell if it’s cracked. So if there’s a crack, your technician can easily show it to you. Soot buildup and discoloration: When there are cracks on the heat exchanger, soot from the combustion process will sometimes build up around the crack and discolor the metal on the heat exchanger. Carbon monoxide detection: If you hear an alarm from your carbon monoxide detector, you should immediately contact your local fire department. If they determine the leak is coming from your furnace, it’s most likely your heat exchanger’s fault. Carbon monoxide is a byproduct of the combustion process, so if there are cracks on your heat exchanger, it can seep through and enter into your home’s air. Unsteady furnace flame: A damaged heat exchanger may produce a flame that jumps and dances while the blower fan is on. When an HVAC service person visits your home, have them show you the primary sign, as that’s the one that will definitely prove your heat exchanger is broken and should be replaced. Your furnace warranty: Most furnace warranties include a 10–20 year warranty on the heat exchanger. So you could save $500–$600 if your warranty is still valid. The type of heat exchanger: Heat exchangers match the brand and model of your furnace. So if you have a more efficient furnace or a more expensive brand, then your heat exchanger will also be more expensive. The HVAC contractor you hire: Every company charges differently. Some charge by the hour, others charge a flat rate. It all comes down to the quality of the contractor. A smaller, less experienced contractor may charge a lower flat rate than a more experienced contractor. It generally takes about 5–8 hours to replace a heat exchanger, so if you hire an inexperienced contractor who charges by the hour, you’ll have a higher installation cost. Should you replace the heat exchanger or install a new furnace? Here’s what we recommend: The average lifespan of a furnace is 12–15 years, so if your furnace is close to that age range, it may be a good idea to just buy a new furnace. That’s because older furnaces will break down and require more part replacements and repairs. Instead of spending money on repairs and replacements, you can put that money towards a new furnace. On the other hand, if your furnace is still relatively young and in good working condition, and you still have a valid warranty, replacing the heat exchanger is the most cost effective option. Need a new heat exchanger? Contact MSP to schedule a furnace repair appointment today. Or, just call us with any questions you may have about heat exchangers or any other part of your furnace. We’re happy to help! How Much Does it Cost to Repair a Furnace in Minneapolis?